Take I-71 North to the Caesars Creek Exit. Turn Left and Follow the signs for Caesars Creek. At the Fossil dig parking lot hike though the northern field to meet up with the trail near the waters edge. About 3/4 of a mile down the path you will look over a cliff to the waterfall below. Continue on the trail and across the bridge to come up to the falls at ground level. This early morning shot came about while hiking near a local lake. A friend had told me of the small waterfall and thought it could make for a good photo in the right conditions. I saved it's location as a place to check out at some point. 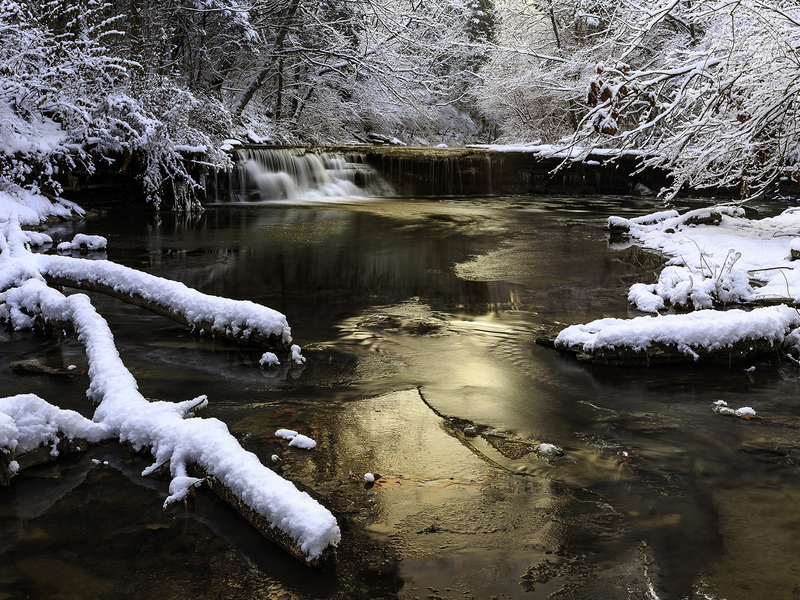 While I was home visiting family for the holidays last year we got a nice snowfall, so I decided to get up early and head out to attempt to capture a photo of the waterfall I had heard of. It was peaceful, crunching through the new fallen snow without another soul to be found. When I arrived at the waterfall, I wasn't sure at first if I could do it justice. After about 30 minutes of navigating in the freezing cold water downstream I decided on a location and waited for the light to turn the water a beautiful golden color.